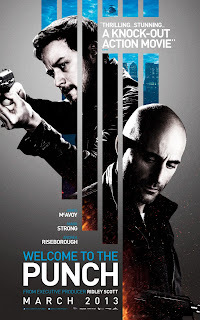 Recently on 30th March 2013 I saw Welcome to The Punch, it was my last chance to see it as one of my local cinemas was showing it for the last time on 30th March. 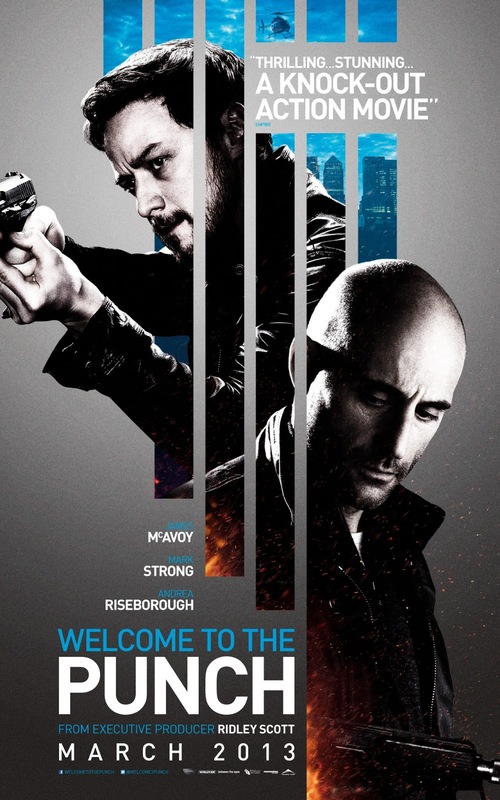 It was my first action film and the only reasons I really wanted to see it were because of James McAvoy and Daniel Mays as they are both in it. If you still have chance to see it where your from I would highly recommend that you go and do. The general plot without spoiling it is the film is about an ex criminal called Jacob Sternwood he forced back to London when his son is involved in a heist that goes wrong. By doing this it gives his arch enemy Mark Lewinsky one last chance to get the man he's always been after. While I was heading to the cinema I kind of expected what the film was going to be about lot's of action, drama with guns car chases but in a way after seeing the film it is so much more than that. Right from the beginning of the film the audience gets thrown into the world of Mark Lewinsky played by James McAvoy and Jacob Sternwood played by Mark Strong. Thrown right into the action and straight from the word go I found myself secretly wishing that Mark would get Jacob. At the start this is what the film is about and I went in to the cinema expecting that but by the end of the film, it takes so many dramatic twists and turns that I didn't even see the end coming and I'm sure you won't either. Before I talk about the characters I just want to mention where the film is set, it's set in London at night time most of the action happens and there is some beautiful scenery cinematography in the film. Especially the colour blue the director of this film Eran Creevy made James McAvoy's eyes so blue. Really the cinematography in this film is amazing and great I love London anyway but this film really makes London look even more prettier in the night life, if that's even possible. Now as I said earlier one of the reasons why I went to see this film was because of James McAvoy. I love him anyway but my love for him is growing more and more as I go to see him in new films and his acting is just brilliant. Seriously if you haven't seen him in anything then this is one of his films I would recommend that you go and see him in. Another reason I said earlier that I wanted to see this film was because of Daniel Mays. Now I had no idea what character he was playing or which side he was on before watching the film. The only bad thing I would have to say about this film is Daniel Mays isn't in it enough his character is like Channing Tatum's in Side Effects, there is just not enough of him. However I am pleased that he got to share the screen with James McAvoy again as I haven't seen that since the Atonement days, I also love that film so when I saw them on screen together I did get excited and I was very happy. As this film was made in Britain I recognised lots of the cast for example David Morrissey who was in an episode of Doctor Who and True Love. His character in this was Thomas Geiger and I thought he played his character really well. I also recgonised Jacob Sternwood's son he was in an episode of Casualty, I thought I also recognised Andrea Riseborough's character she played Sarah Hawks but I don't know, probably just my imagination playing tricks on me. I thought she played her character really well, I really liked her but like Daniel Mays character she's not in it enough, there seems to be a relationship blooming between her character and James McAvoys character but that is snatched away before it really began. Overall I would recommend this film, if you like drama, action, secrets being revealed with twists and turns then this is one for you. I really liked the music as well it fits really well with the film in the scenes and where it's set as well. I hope I have done this film justice by this review, the ending is really unexpected and I found myself wanting to know more and really shocked by the ending, I was asking myself did that really just happen? If you've seen Welcome To The Punch let me know what you thought of it by commenting.